“I love the mornings when I wake up and go downstairs before the kids are awake, knowing I have 400 brownies to make that day”, says Katy Howell, creator, cook and owner of Bayside Bakery. That’s pretty much every morning for Katy now, as her brownie business is a brilliant success, ensuring she is busier and busier. Winning a Gold Award at Taste of the West, only one month into starting the business, Katy’s brownies are claimed, by those in the know, to be the ‘best in the Western World’. 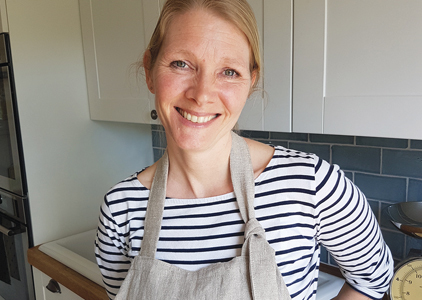 Katy has created a brownie niche for herself, supplying cafes in and around Bridport, as well as operating a stall in Bridport Market and Bridport Food Market. Sending brownies by post in beautiful gift boxes, Katy also creates stunning decorated brownie towers for weddings and parties. She bakes from her home kitchen in Loders. Since starting the business a couple of years ago, her husband Andy has had to extend the kitchen, installing an extra oven, just to keep up. As Andy is a handyman by trade, Katy admits he’s a useful husband to have around. Previously, Katy worked for 12 years as a nurse in Intensive Care. She trained, worked and lived in Hampshire, alongside Andy, who also used to be a nurse. After a camping trip with friends at Highlands End, they made a life-changing decision over dinner one night; deciding they wanted to live near Bridport and have their children; Rosie and William attend a local village school. On a subsequent trip, they found Loders and knew it was the village for them. The family relocated and haven’t looked back. “I do constantly feel lucky and still pinch myself how lucky I am”, Katy smiles, while leaning over her mixing bowl, with Nina Simone’s Feeling Good triumphantly playing through the speakers.